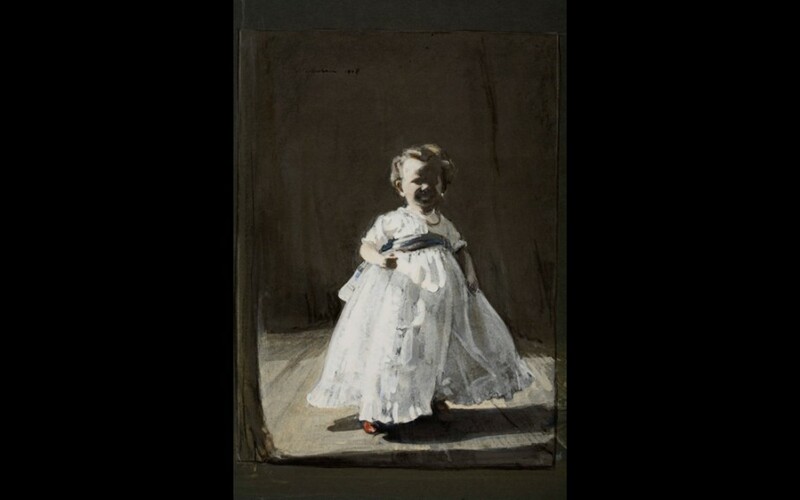 This display of works from the Whitworth’s collection reveals ideas surrounding shadow as captured by artists in a variety of medium. The deep, theatrical shadows of Paula Rego and Käthe Kollwitz bring to mind the chilling enchantment of the phantasmagoria. Employing gentle washes of watercolour, Turner’s ethereal silhouettes and Barbara Bodichon’s ghostly ships evoke time’s passing. The cavernous hands of the sculptor in Henry Moore’s etching and the velvety darkness of Anish Kapoor’s ‘Blackness from Her Womb’ suggest dark places as areas for creation. The inky gloom of Rembrandt’s ‘The Three Crosses’ conveys the power of shadow to reflect divine damnation whilst the exposed mausoleum in Rachel Whiteread’s screen-print reinforces the ancient notion of the dead inhabiting a world devoid of light. Painted at the age of nineteen, Bodichon’s representation of this Irish scene reveals both her skill as a watercolourist, and her concerns with the political issues of the day. This depiction of despair, set against a dramatic, impending sunset, alludes to the potato famine in Ireland between 1845 and 1851. 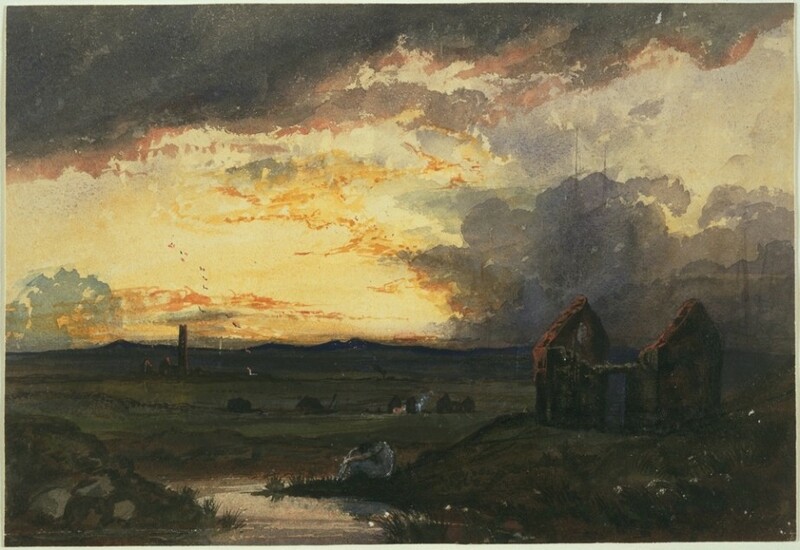 The ruined cottage, desolate figure and brooding landscape form an allegory for the Irish disaster. Emerging from the clouds and just visible above the cottage are the ghostly apparitions of ships’ masts. These delicate phantoms suggest the woman’s dream of escape across the Atlantic or the recent departure of loved ones. 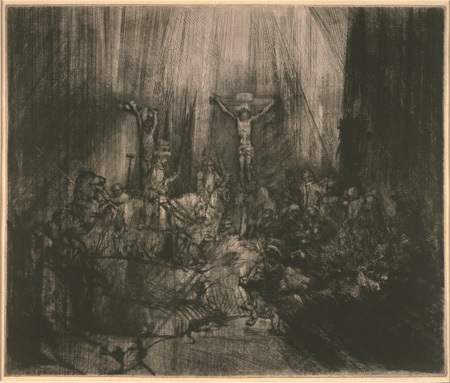 The subject for Rembrandt’s print is taken from Luke’s description of the crucifixion of Jesus, when “there was darkness over all the earth until the ninth hour; and the sun was darkened.” This is Rembrandt’s fourth version of the scene, created after he had dramatically re-worked the etching plate to create greater depths of light and darkness. These areas of dense shadow and powerful luminosity create an unnatural scene of divine power. Kollwitz grew up with a deep sense of social commitment which informed her life and her printmaking. This chilling image of a peasant preparing for revolt is a study of violence born from repression. She worked on the ‘Bauernkrieg’ (Peasants’ Revolt) series between 1902 and 1908. 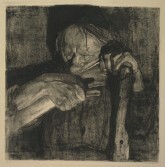 The themes were inspired by a sixteenth century peasants’ uprising in Southern Germany, but Kollwitz’s images were also a commentary on the plight of the German working population of the early 1900s. 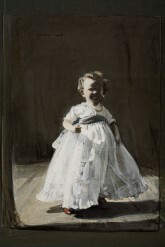 The deep, theatrical shadows of the print enhance the drama of the scene and create an intensely unnerving atmosphere. This vibrant drawing is one of a group of studies of clouds and water which were probably made during Turner’s time in Margate during the 1840s. These studies do not appear to be preparatory to other works, instead they show how the artist, in his old age, used watercolour to record the shimmering effects of light on water. The location is a temporary landscape, revealed momentarily by the receding tide. 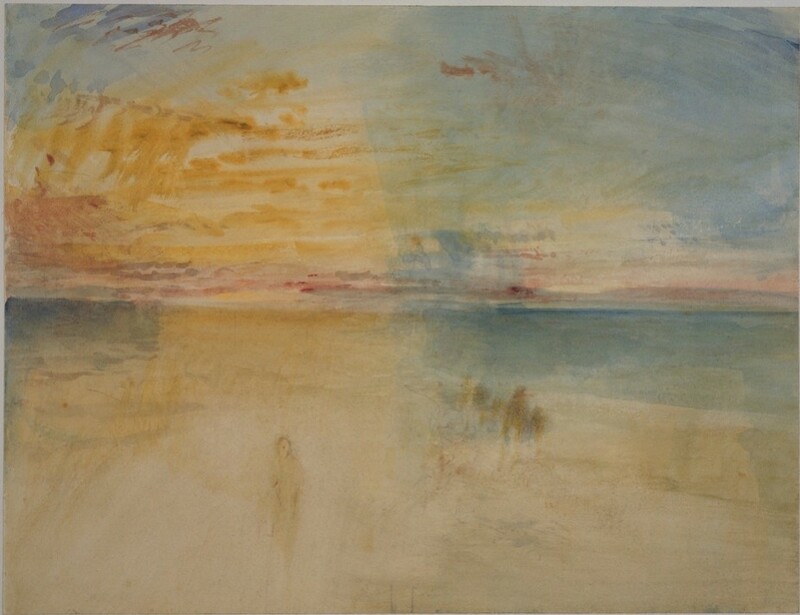 Turner animates the scene with the presence of ghostly figures, emerging against the brilliance of the wet beach. The fortifications of Paris had been constructed between 1841 and 1845, entirely encircling the city with a thirty kilometre wall. Intended to defend Paris from invasion, they became defunct by the 1880s when the working class used the area around the ‘fortifs’ for promenading and relaxing. By night, however, they became a notorious area for crime and prostitution. 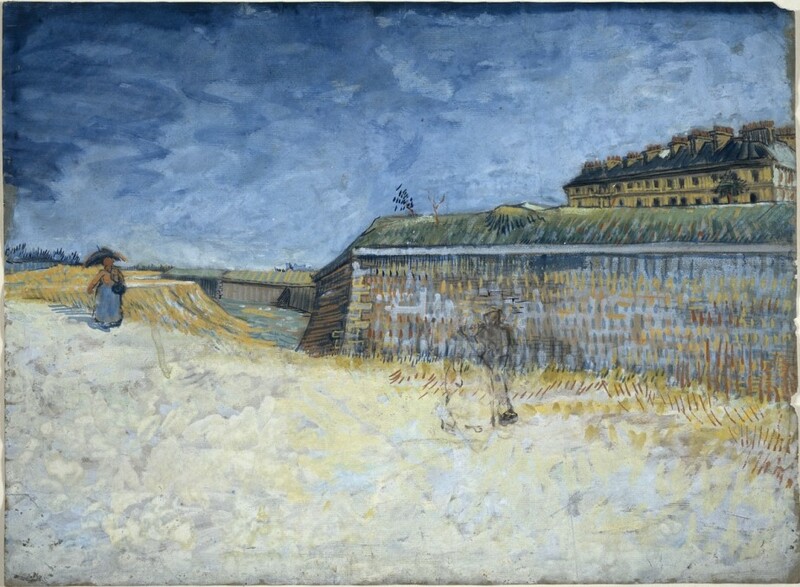 Also known as the ‘terrain vague’, the transitory nature of the area is evident in Van Gogh’s depiction. The scene is a featureless space which people momentarily occupy. The two promenaders in the foreground have been erased by the artist, leaving a ghostly trace of their former presence. I am contacting you to asl if you have published a catalogue for the exhibition: Dark Matters. I would be very interested. I’m afraid there is no catalogue for this show. But I’d be happy to send over the small brochure which accompanies the exhibition if that would be of interest? Is it possible to use the above images to publish in a newsletter for company members or do we need to contact the press department separately for that? Please contact our Press Department for image related enquiries: 0161 275 7472. Hi. Can you tell me if the whole exhibition is continued this year, including all the works on the ground floor? I came in 2011 to see it, but the gallery closed before I had time to get round all of it. Thank you. I visited this exhibition while it was on and it was absolutely fantastic, one of the best I’ve ever seen in fact. Brilliant collection of works, well done.